Jim de Jong is a young chef who makes Rotterdam swing. He opened his first restaurant in 2013 in a former train station. The adventurous gourmets who flock there every night (no lunch service) rave about his cooking that makes the connection between Italian “slow food” and Dutch ecological responsibility. 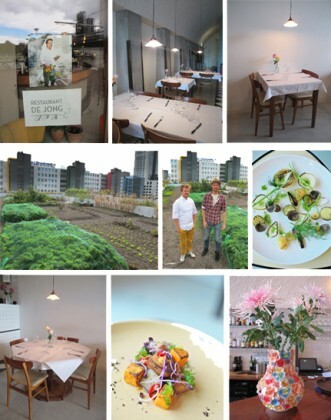 And so, it comes as no surprise to learn that the chef is one of the Dakakker’s best customers, which is the largest vegetable garden installed on a roof in Europe! Just a few minutes’ walk from the restaurant is a ten story building where the roof is completely vegetated. A team of volunteers looks after the 1,000 m2 sky-high garden. They produce thirty varieties of vegetables, a dozen herbs and twenty edible flowers. Jim de Jong, who prepares two surprise menus (one of which is vegetarian) every day, receives an ultra-fresh delivery by bike every day. A self-professed lover of plants, Jim should also quickly become a customer of two young environmentalist entrepreneurs who have just started growing mushrooms in the basement of an old abandoned pool! They gather coffee from the city’s cafés and grow succulent mushrooms on this prime ingredient that was otherwise destined for the trash. Urban gardening, recycling and eco-environmental responsibility make up the current wave of fresh air blowing through the culinary scene in Rotterdam. A trend that the largest port in Europe intends to export very soon! Wander Around – "Gueule de Bois"